Regent's Park Albert NW1 is a spacious conversion flat on the lower ground floor of an attractive period property. 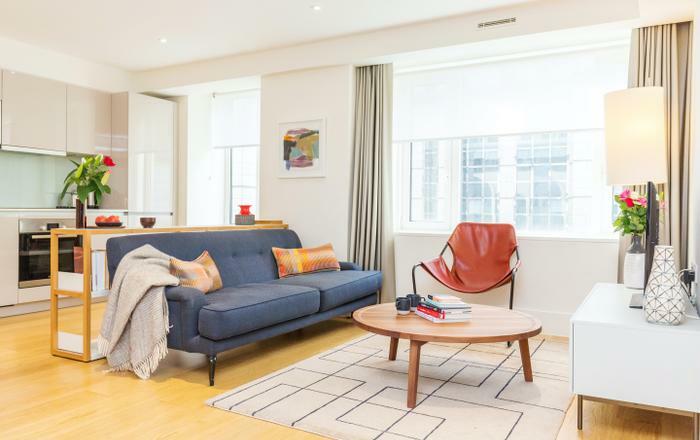 This short let London home is well located on a quiet Camden street, close to to Mornington Crescent Underground and the lovely Regent's Park. It has a spacious living area with sofa and chairs, feature fire place, TV and WiFi. There are also two single beds arranged for seating but useful for sleeping two people. Adjacent is dining area with a table and seating for six. The kitchen is open plan and fully equipped with a gas cooker, fridge/freezer, dishwasher, crockery, cutlery and cooking utensils. The bedroom offers a king sized bed and good storage space. Newly laundered bedding and linen is included in your stay. The bathroom is en-suite and has a walk in shower. A separate washer and dryer are located here. There is also a separate WC. Towels and soap are provided as standard. There is a quaint patio area to the front with a table and chairs. - Mornington Crescent underground - Northern line - Zone 2 - 5 minutes walk. - Euston & Kings Cross Station - National Rail, Northern Line, Victoria Line, Piccadilly Line, Hammersmith & City Line, Circle Line, Metropolitan Line - zone 1 - 15 minutes walk. A cot may be provided subject to availability - please request when you book. “Everything about this place was great. Camden is a really nice location, with easy access to the centre of London. Loved the local pub and Mornington Crescent Station. Great street, felt really safe and homely. Hosts were really friendly from the moment we booked. Explained everything, helped with recommendations, very easy going, met us on arrival and made sure we were comfortable and had everything we needed. The actual flat was better than it looks in the photos. Great kitchen, living room, modern bathroom and bedroom. Clean. Comfy. Had sky sports on TV. Cosy and had a great feel to the whole place. Will stay here again. It’s great!” Mitchell, Australia, Dec 2018. We stayed in the flat for 5 nights: 2 adults and 2 teenagers. The Flat is very cozy and pleasant, it indeed felt like home. The single beds mattresses are soft, whereas the double bed mattress is not. It suited us perfectly as the younger generation preferred is softer... There are two toilets in the apartment which is very convenient. The location is perfect: 3 minutes walk to LIDL supermarket and 5 minutes walk to Mornington Crescent tube. 5 minutes walk from Camden “scene”, and 10 minutes from the markets. I really recommend this place! We will be more than happy to come back. We had a great time at the flat, which could not be situated in a better location, moments from all the action in Camden, yet still quiet and peaceful. Liz was a great host and very available to answer our questions, as well as flexible with the check in and check out process. The flat itself is well appointed with a nice living room, very functional little kitchen, lots of storage, and an extremely comfortable bed. It was a great bonus to have a second bathroom, too. We would definitely come back again! So happy to find this place. Perfect for us, 2 adults and 2 kids! Clean and comfortable. Wonderful hosts. The best part is the location. Very convenient, only few minutes walking distance to train and bus stations and close to many nice restaurants and also Camden market. We love it and will definitely stay there again. Great location in Camden Town, quiet but right on a lot of bus lines and the tube was right there. Really nice place that was comfortable and well kitted out. Great bed, shower was great, quite clean, nice small kitchen. Would really be ideal for small family of 3 or 4, plenty of space for everyone. Nice manager who was helpful. Wifi and TV and all worked great. Recommend highly! Great place! 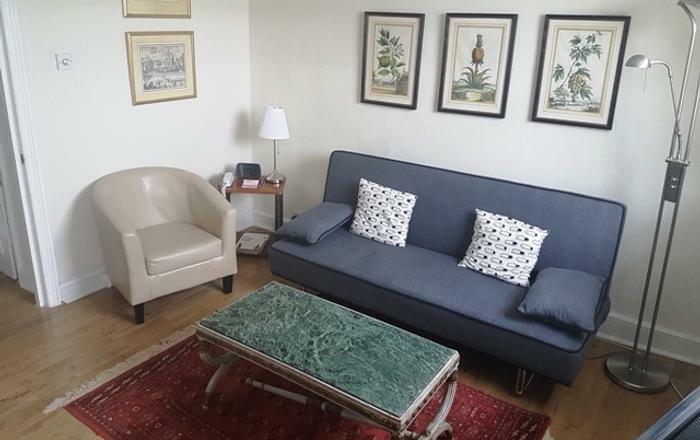 We, my two sons (22 and 25) and I, stayed here for 5 days and it was perfect for us: spacious apartment, nice and quiet area, lot of shops and restaurants nearby and several buses and Northern Line taking you directly into the central parts of London. We appreciated most the comfortable beds, the living room area, the washing machine, the dishwasher, and the extra toilet :). The very nice and helpful host lives and work in the same house which was convenient. The apartment is below the ground floor which makes it a little bit dark, but it did not matter to us as we were out all days anyway. Great flat, very cozy and really comfortable beds. The location is perfect. A quite street, close to a tube station and to many bars and restaurants. 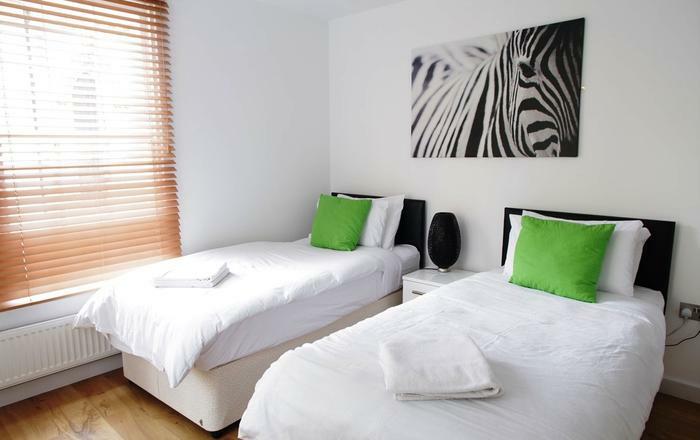 Walking distance to the Camden Market, the London Zoo and Regent's Park. Would definitely stay again. Jennifer and Liz were very helpful and helped us to meet all our needs. This was a dream vacation! Thank you. Nice place in a silent area. Well-equiped flat. Thanks for some nice days in your flat. We had a wonderful stay in London in this very comfortable apartment (real beds for 4, nice living room), well equipped (even to do laundry), in a quiet street but only 5 minutes walk to buses, subway, restaurants and shops. To recommend. We had a lovely holiday with our 4 year old daughter. The flat was great and had everything we needed, even toys! The location was great with a playground and Camden Town market and all the shops and restaurants just a walking distance away. Great host. Location is perfect for eating out, theatre and walks in the park. Quite easy access to pretty much everywhere. Appartamento delizioso e confortevole, sono stati molto gentili e disponibili (ci hanno anche tenuto le valige l'ultimo giorno, una volta fatto il check out). Posizione perfetta a 5 minuti a piedi dal Camden Market e a 2 minuti dalla fermata della metro. Ci ritornerei assolutamente. Nous avons passé un excellent séjour à Camden. L'appartement est très bien placé, tout proche des transports en communs, des restaurants et pubs ainsi que des magasins d'alimentation. Accueil sympathique, propreté, nous reviendrons avec plaisir. Staying at this flat for an extended weekend was amazing. The location is very close to two underground stations witch makes it very easy to commute. The flat is at the very good location, close to the Regent's Park and funky part of Camden area but in quiet ,residential part, just few minutes walk from the main street where all the shops and restaurants are. Our hosts were kind enough to let us leave the suitcases fro the day and check out a bit later than we planned previously. Overall we had a very pleasant stay and would definitely recommend to anyone thinking about booking this London Agent flat. Great place for couples, families of 4, friends... Very close to all transport, a lot of good supermarkets, restaurants, etc. The Camden Market is 5 minutes walking and it is awesome. The owner was great, she gaved us a lot of good tips for and in the area. She even left us something to eat and drink because of our late arrival. Jennifer was super easygoing, replies quickly and informs you well. Thank you for your kindness, great hospitality and for an amazing trip. Congratulations for a really great apartment. We had a great time. The place is close to lively and funky Camden Town center with bars, shops, restaurants and everything you would be looking for. The street itself is super quiet and peaceful, providing the best of both worlds. We arrived late in the eve, so Liz had bought eggs and bread for us as a welcome snack. Super thoughtful and welcoming. We definitely recommend staying here. The apartment is fully equipped. It is spacious, bright and clean and is in a beautiful spot in the north of London, close to subway and bus stops. Nice shops and restaurants nearby, as well as the beautiful Regents Park and the great Campden Markets. An ideal base for exploring the city. A very nice apartment that I can recommend to anyone. This apartment in Camden was such a great place to stay- so close to parks, markets and easy access to tube. We liked the quietness and the location. The flat is comfortable and spacious. Also, it is well equipped with cooking utensils. The London Agent was very friendly. They gave us a lot of useful suggestions on transportation and dining. They also let us have a late check-out on the day we departed. We were welcomed immediately and shown all the details of the flat. The hosts were very helpful with details on the surrounding area and more than ready to help with any questions we had. The flat was comfortable, clean and spacious. The kitchen was well stocked and there was even laundry soap for us to do our laundry. It was very enjoyable to stay in this part of Camden Town as it was easily accessible to the metro, buses and shopping and eating areas. We loved everything at your flat. 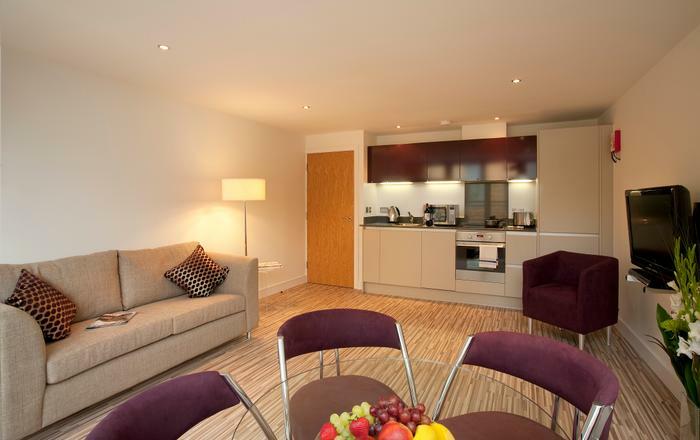 Thank you so much for making our stay in London easy, comfortable and so enjoyable! Melissa, Arizona, USA, June 2016. This flat was an excellent choice. I was traveling with my adult daughter to London on her first visit to Europe. The flat was excellent for her first visit. xlnt location to attractions, shops, restaurants, Camden Markets, subways, and bus lines. xlnt location near St Pancras: Eurostar to Paris. Direct train to Gatwick Airport. Just a quick Uber ride to the train station. Reasonable for what we got. Very thin floors above. Could hear a lot of noise from above constantly. The pluses outweighed the negatives, and would absolutely come back to this unit, and recommend it to anyone looking in London. Real Find Near Regent's Park NW1 worked out beautifully for my family's recent trip to London (April 2016). The owner was very accommodating and thoughtfully made up the fourth bed on the chance that my daughter studying at UCL might want to spend nights with us during our stay...and my daughter ended up doing just that! The location (in Camden Town) was great; good pubs, restaurants and the Camden Lock Market are all within easy walking distance. We also walked (and my daughters ran) through Regent's Park and on up to the nice view of London from Primrose Hill. Getting into London proper was easy as well. We cooked two dinners in the flat and made nice hot breakfasts every morning...we had everything we needed. I would definitely recommend this "Real Find" for families and would like to rent it again on my next trip to London. Belinda, April 2016. We had a wonderful stay in the flat. Liz and Dek were easy to communicate with and very welcoming when we arrived. The flat was well stocked with everything we needed to make our own meals, with many amazing restaurants in the neighborhood for dinner. With two small children, it was great to be so close to the supermarket and underground station. Beds were comfortable, the flat was well-heated, and the wi-fi was reliable though a bit weak in the back bedroom. 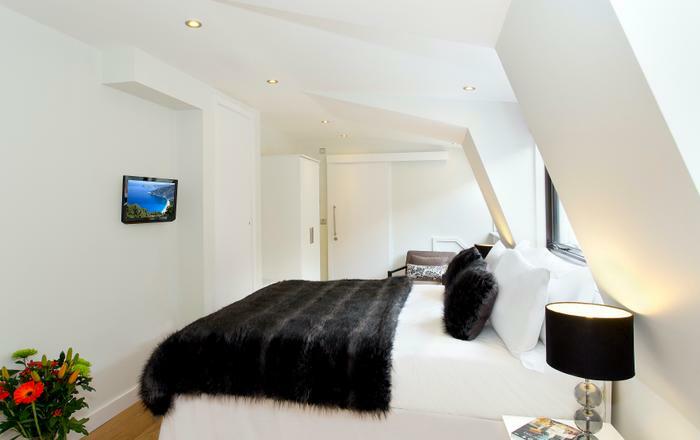 We would definitely recommend the flat to other families traveling to London. Thanks, Jayatri. March 2016. We spent three enjoyable weeks in this ground floor flat, which is located on a quiet street in Camden Town. The flat is close to two underground stations, many bus routes, supermarkets, Regents Park, as well as numerous shops and good restaurants. The flat itself is spacious, comfortable, well-equipped and, importantly, everything works. It was a genuine plus to have the owners living in the same building -- they were always available and most helpful when we had questions. The flat is good value and we're happy to recommend it. Thankyou for a good holiday. Our little group had a lot of fun in Camden. We walked everywhere we wanted to go and found some wonderful local places to eat and shop. You really don't have to leave this area at all…there is so much to see and do. Everybody was very friendly also. Happy days in Camden! We enjoyed our stay here so much. The building is on a nice quiet street and you can walk everywhere. We really loved Regent's Park and London Zoo which I recommend to everybody. The flat is a one bedroom but sleeps four people comfortable. We felt very at home here. Camden is a great neighborhood to stay in, you will find a lot of good pubs and restaurants, and the market, of course, which is always a lot of fun. Thanks for a problem free stay. We loved our visit! The flat was fine, roomy and comfortable. I recommend the location more than anything. Regent's Park with London Zoo is just wonderful with so many attractions for the whole family…we enjoyed walking there several times. I would stay here again. What a great area to stay in. We felt we had the best of both worlds in this apartment: the energy and fun of Camden while living on a pleasant, residential street. Plenty of things to do around here and you can walk to most of them. We enjoyed our stay. I spent 4 weeks here in March. The owner is extremely helpful and the accommodation is just great for a long stay or short. It felt like home. Everything one could need to feel at home is there. When the toaster died it was replaced that day. The location is great, close to all the stores, restaurants, movies, public transport that you could possibly want but also on a quiet street. Very nice to have the little space in front to sit and have coffee on a sunny morning. I was looking for a new home in London and would have been happy to live here! We had a most pleasant time in this comfortable, spacious flat. The building itself is charming and we felt that we were part of a proper London community for a while. Spacious basement apartment in nice and quite residential neighborhood. Few minutes walk from the underground and Camden Market only 10 min walk away. Helpful and friendly host. Regent's park and Hampstead Heath nearby. We really enjoyed our stay in the parks around on some of the warmest days in London ever. We had a wonderful stay. The flat was convenient to the Tube and to shops. We found our way there easily, and the accommodations were as expected. We were out and about every day if our trip, so we were really only in the flat for breakfast and sleep. Even so, we were kindly greeted by our host nd enjoyed our stay. We would recommend the flat! "Wonderful clean, comfortable stay in Camden"
Just returned to the us after 8 nights at this flat in Camden. The flat was terrific -- the only people I would hesitate to recommend it to would be someone with mobility problems, (as there was a short flight of stairs leading down to the entrance) or someone who required "luxurious" rather than "clean, roomy and practical". We were a groups of three (husband, myself and adult daughter) and compared to any hotel room(s) we could get for all three of us this was a terrific bargain and much more comfortable..
To specifically address a couple of concerns in the previous review -- the toilet worked fine as long as you gave it a minute of two between flushes -- which might have been a problem for a group of five people but was not a problem for us. There was nothing wrong with the shower -- the shower head was the type you could hang from the wall or take down and hold in your hand. The previous reviewer called the place "a bit studenty" -- well, if by "studenty" you mean economical and practical rather than luxurous and expensive, that was fine with us. Everything was quite clean. The owners were quite helpful -- Initially they gave us two keys, and when we asked if we could get a third they had an extra one made for us. The gas fireplace was a bit tricky, but the owner came down and showed us how to work it. Bedding was cosy and towels were plentiful -- big bath towels were much appreciated. Lighting was ample (hotel rooms never seem to have adequate light for reading.) The kitchen, as others have noted, was well equipped. The TV got zillions of channels. Free WiFi worked well. The location was perfect for our needs -- a quiet residential street two short blocks off Camden High Street, which at this end of the street (near Mornington Crescent station) was full of grocery stores, restaurants, take-away shops, etc. (Further up -- between Camden Town and Chalk Farm -- the street becomes a crowded, touristy extension of Camden Market) A couple of blocks away in the other direction was Regent's Park, which provided a lovely, tranquil respite from London crowds and traffic. I was very satisfied with the efficiency of your employees - my rating is excellent. Very good location, excellent appartment. The pictures show the real place. It was easy to contact with the owner. Warm reception, nice place, good situation, good price. We had a great stay in this apartment. The place was clean and relatively spacious for 3 people with all facilities present and working properly. Absolutely fantastic and safe location. Less than 5 mins walk to Mornington Crescent station which can get you into the heart of the city in 10 minutes. Plenty of supermarkets, pubs and eateries close by as well. London Agent were extremely helpful with everything and any requests we had were dealt with promptly. Thy even let us have online shopping delivered to their place and they took in our packages when we weren't there. Definitely recommend this place. Excellent location, very close to the tube station. the apt. itself was very clean, comfortable and nicely decorated. the house includes all the amenities (dishwasher, washing machine, drier...) and even a coffee machine :) the apt. is suitable for couple and small group of friends as well. smoking is permitted in the outside porch which was excellent and meant the apt. didn't smell of smoke :) the hosts were very kind and even helped us with storing our luggage until our flight! we strongly recommend this place and would come back in the future! A nice apartment in a fantastic location. Apartment matched expectations exactly as per photos. 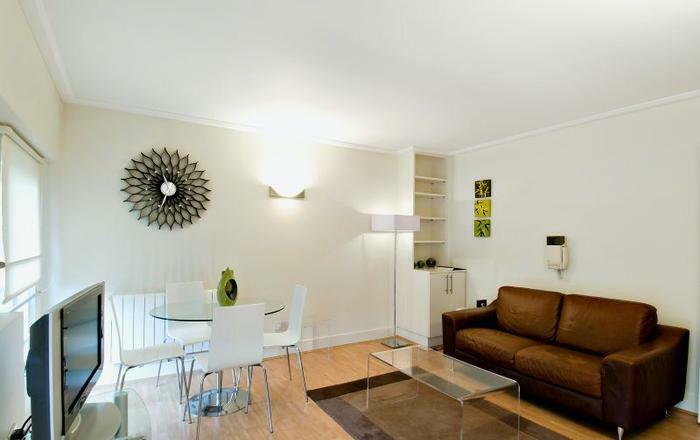 Situated on a lovely quiet street only 3 minutes walk from the tube station and the bus stops. Underground is really easy to get around on, but we tried to take the bus whenever possible as you see more, and the property is so close to the centre this is easy to achieve. Peter & Robin, New Zealand, Oct 2012. Very nice and good location. Acctually it is a basement, but if you use it as a place to sleep only than it is OK. The bath is next to the bedroom which was not so comfortable from my point of view but as general the place is fine. Roni from Israel, September 2012. Thanks for making all the rental arrangements. We had a very comfortable time at the flat. You were charming hosts and made sure we were comfortable. All the appliances worked and so did the internet which was an important consideration for us. The flat is clean and has all the amenities a traveller with a small family would want. The location is also very central and the proximity to the grocery stores, restaurants and other shopping is a big plus. Overall, we were very happy with the accomodations. Thanks again. Please do convey my warm regards and sincere appreciation to Liz for taking care of us. Muy céntrico y en una calle muy tranquila. Calidad/precio excelente. El apartamento esta muy bien acondicionado y amplio para una familia con dos hijos. Estuvimos una semana, la propietaria, es muy amable y dispuesta a ayudar en lo razonable, lo que contribuye a darle al apartamento un carácter muy familiar. This was the perfect place for us to base ourselves during our stay in London. Wonderful facilities - kitchen well kitted out which meant we could self cater and keep costs down. Important for our family of four. Very close to two tube stations, Regents Park walking distance as was the Camden Markets and lovely local pubs. Nice quiet street. Liz and her family live upstairs and went the extra mile to make our stay special. We would stay again and highly recommend it. Great location, close to all transport,owners very accommodating if anything was needed, will book again next 12-18 months. Kon999 Coffs Harbour Australia . Location was great, easy to walk to anywhere and just a couple blocks from buses and tube. Clean, comfortable, location with everything I could possibly need. Owner was right on location to meet me and very nice. Nice place, nice tenants, clean"ish" a bit of spider webs, here and there, but nothing major! Useful kitchen, spacious living area and dining area, just a bit annoying the fact that you have to go through the bedroom to go to the bathroom, specially if you have kids sleeping in there. Well situated , in a calm street, but 2 minutes away from a busy street with loads of take away, shop for food, and the underground station. I'd go back! We had a great time visiting London from the Camdem apartment. The owner gave us a very warm welcome, despite we arrive late at night. She even bought for us some stuff for breakfast. The place was perfectly confortable for us and the children and it was very well situated to visit London. The neibourghood was very nice and quite and we appreciated how near were Regent's park and Camden Market. Everything was like we had arranged. Liz, its owner, is a very nice lady, eager to help. Everything was clean and very tidy. It's in a quiet place, easy to reach any place from there. I highly recommend renting this flat. The flat itself had everything one could need in a nice compact arrangement. It's perfect for 2-4 people. The owners were very nice (and had lovely dogs) and would give advice when requested but did not hang around too much. The location is great (2 Tube stops on the Northern Line just outside zone 1 are within 5 minutes walk) and the neighborhood had everything. Good variety of restaurants (Namaste Kitchen was particularly good), shops, pubs, with a nice Marks & Spencer food hall, Boots, book stores, etc. are within 5 mins or so but the flat is still quiet. Would definitely stay there again.